As with many things, the true beginnings are sometimes hard to pin down. I’m sure it started with a conversation, an idea, and encouragement. 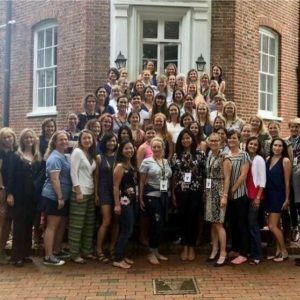 My classmate, Susan Balcirak ’98, sent an email and posted on a Facebook page seeing if the women of our class had any interest in getting together as women in conjunction with our 20th reunion. Just about half of us said yes to the reunion and the women’s brunch. Some said yes with excitement to spend time with the other women of our class. Some said yes with trepidation wondering how the other women would treat them after twenty years. Some said yes with a sense of obligation knowing that they should want to go. The brunch was an amazing time of fellowship and fun. I have yet to find someone who was there who didn’t feel that this event was particularly special. Afterwards,Jeannette Gaudry Haynie ’98 wrote a fabulous post on her Facebook page sharing her thoughts about the experience, and I felt empowered to share my own. These two posts started another conversation (read the transcripts of these two posts here). How do we take these feelings of empowerment and fellowship forward? How do we help the classes following us find these feelings sooner? What can we do to make things better? And many said that we wished we could do something. So I made a messenger group with all the women who said they wanted to participate, and we started talking. At the same time, Michele Philips ’98 said we should make a t-shirt, and others responded, YEEEESSSSS!! Those messenger conversations turned into teleconferences and research to determine how best to lend a voice to the Sisterhood. Since we are STRONGER TOGETHER, we reached out to Barbette Lowndes, ’80 and the Women’s SIG, and we are so happy to join with them in this endeavor. The T-shirt idea has raised funds for the Naval Academy Music Programs and will fund two girls to attend either Summer Seminar or the Naval Academy STEM summer program. The lesson to me is great ideas and great conversations turn to action with encouragement from our Sisters, courage and planning. Each of the founding Sisters had an idea, provided support, and contributed to the plan to make this happen. Now we need you – members and advocates of the Sisterhood – to lend your voice and tell your stories. We know that, though we were forged in the same crucible, we have different views, but we all have the same goal – to make the experience for women at USNA, women still serving in the military and our veterans better. That means sharing our wins and our losses our successes and our failures. We have been victims of bias and perpetrators of the same. Progress comes with truth and understanding. Share your stories.